Embedded World, Nuremberg, Germany—February 25, 2014—Today, IAR Systems® releases a major enhanced version of its complete and high-performance development toolchain IAR Embedded Workbench® for ARM®. Highlights are multicore debugging functionality and support for automatic NEON™ vectorization which significantly strengthens development of complex applications. Multicore applications often interact in complex ways and are therefore challenging to debug. With support for multicore debugging in the comprehensive C-SPY® Debugger in IAR Embedded Workbench for ARM, developers are able to simultaneously debug two or more identical cores, symmetric multicore processing (SMP), or two cores with different architectures, asymmetric multicore processing (AMP), in one single development environment. This makes it considerably easier to find program errors during development. For developers working with applications based on ARM Cortex®-A processors, especially with multimedia and signal processing applications, the support for NEON vectorization is crucial for top performance. ARM NEON is a Single Instruction Multiple Data (SIMD) architecture extension developed by ARM and is implemented as part of the ARM processor, but has its own execution pipelines and a register bank that is distinct from the ARM register bank. With the possibility to automatically vectorize the code, developers are able to achieve faster application response time, improve application battery lifetime and further meet the market demands for low cost and low power. IAR Embedded Workbench for ARM is a complete development toolchain including the highly-optimizing IAR C/C++ Compiler™ and the feature-rich C-SPY Debugger incorporated in a user-friendly integrated development environment. 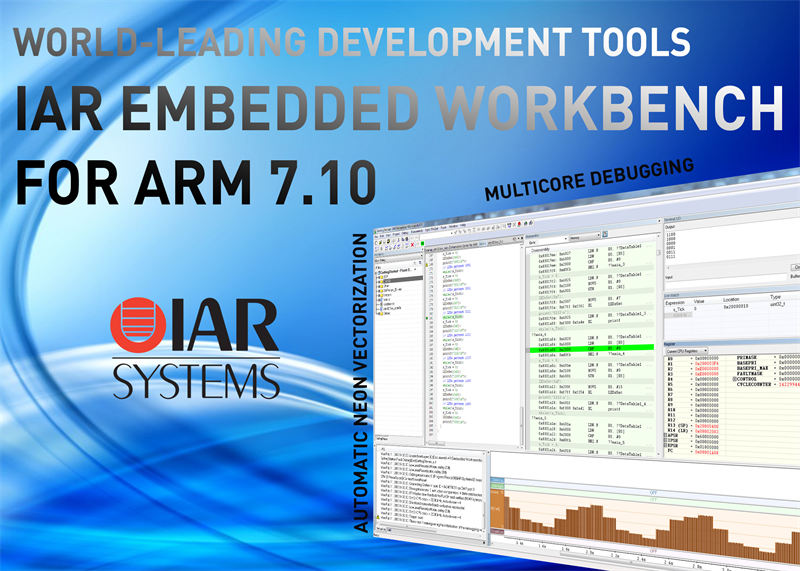 Support for the latest devices is added to version 7.10 of IAR Embedded Workbench for ARM which further expands the tools’ leading support for all ARM cores. Read more and download evaluation licenses at www.iar.com/ewarm. Editor's Note: IAR Systems, IAR Embedded Workbench, C-SPY, C-RUN, visualSTATE, Focus on Your Code, IAR KickStart Kit, IAR Experiment!, I-jet, I-scope, IAR Academy, IAR, and the logotype of IAR Systems are trademarks or registered trademarks owned by IAR Systems AB. All other products names are trademarks of their respective owners.